Cubs representative Mike Lufrano and Ald. 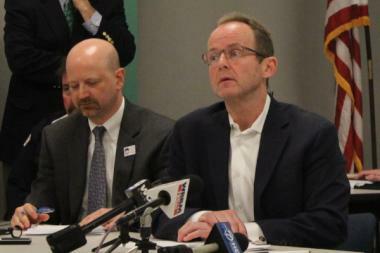 Tom Tunney listen during the annual Wrigley Field Community Meeting in 2014. WRIGLEYVILLE — The Chicago Cubs were unhappy with the way the city's plaza ordinance played out last June, in part for how it restricts access to the area for those without tickets on game and concert days. So it had to be quite satisfying for the club to find that three-quarters of surveyed neighbors felt they should have access to the plaza without a ticket, game or no game. The triangle-shaped plaza on the west side of the ballpark should be ready by midseason, team officials said Monday during the Cubs' annual preseason community meeting. The plaza was a hot topic at the gathering, along with how officials plan to tweak the neighborhood strategies they used in 2016 now that they are the defending World Series champions. It's been 108 years since the Cubs last won the World Series "and we don't know what to expect," Chicago Police Deputy Patrol Chief Al Nagode said. "We don't know quite what the crowds are going to be. Rest assured we will have enough resources" regardless. The Cubs shared results of their Community Connections survey, sent to neighbors who subscribe for construction updates and early concert ticket promotional codes. Some 858 respondents largely said they felt well-informed and satisfied with Wrigley Field construction and the Cubs' trash removal and safety efforts. But 44th Ward Ald. Tom Tunney fired back at the Cubs' pointed challenge to the plaza ordinance. "The Cubs are not too happy with me on odd days of the week — maybe on even days they're a little more hospitable," Tunney said. "But you're my constituents, and what I really want is to make sure your interests are represented." The first-of-its-kind plaza ordinance will last for three years before it will be renegotiated. "We're not exactly sure how it's actually going to function," Tunney said of the plaza. "We really want to be careful for the safety of the fans and the community as to how this operates." Cubs Chairman Tom Ricketts said he hopes to eventually have events on the plaza "every day." Neighbors likely will see a farmers market, family movie nights and "some little music shows" this year, Ricketts said. The plaza is restricted to 12 special events per year, which includes events with attendance of at least 1,000 people, amplified sound or alcohol sales. That would also include allowing fans on the plaza to watch away playoff games if alcohol is sold. Of the 12 special events, only five can have amplified sound. With the World Series trophy present and attendees in high spirits, officials focused on the nuts and bolts of the 2017 season, which opens with a night game April 10 against the Los Angeles Dodgers. Police and Finance Department employees issued more than 10,000 tickets during the 2016 season, a 30 percent boost, officials said. Street crews towed half as many vehicles as in 2015, which "really means people are starting to pay attention to the postings," a Streets and Sanitation Department official said. With few postseason runs in the Cubs' history to test out the best public safety response, Tunney said he "was never more proud of the city than in how the whole postseason went." With discussion resurfacing of blocking off Clark and Addison streets during game days, Tunney stressed that "my goal is to keep Clark and Addison open as much as possible." One potential compromise is to divert trucks away from the intersection to improve traffic flow before and after games, Nagode said. Two critics at the meeting were met with boos from the crowd. Lakeview neighbor David Dalka called positive results from the Cubs' survey "bogus" and "a lie," and said police failed to adequately staff his block near Roscoe, Clark and Sheffield during the final game of the World Series. 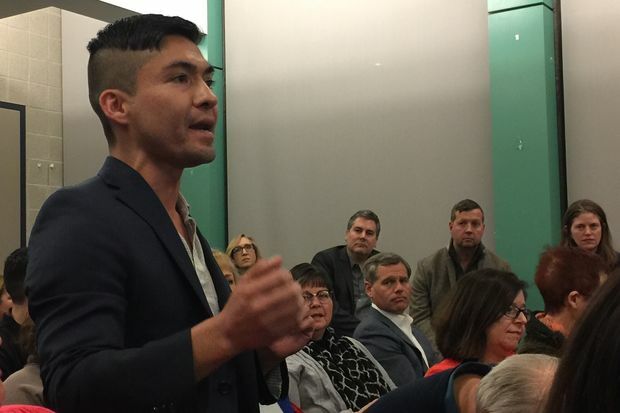 "You've created a new problem with people out there on the side streets drinking," Dalka said. "On my corner, for those who think we did such a great job, there were four businesses there, and four had their windows broken." Another man interrupted Tunney, shouting over the alderman and Nagode to ask Tunney to support a proposed ordinance to better working conditions for some 8,000 airport custodians, security officers and other employees in Chicago. "We're here to talk about Wrigley, and we have plenty of issues to talk about," Tunney said. Many attendees took the opportunity to have their pictures taken with the team's 2016 World Series championship trophy. "I didn't think I'd ever really see it," said Trudie Acheatel, 67, who lives in Lincoln Square. 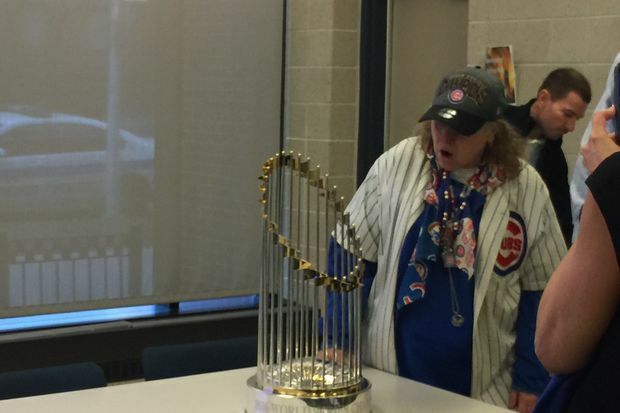 A fan since she was 10 years old, Acheatel showed up to the meeting at the Town Hall District headquarters in full Cubs regalia, complete with a Jesus Guzman jersey, a pin-studded championship baseball cap and a beaded Cubs bracelet she wears "every day of the year." After several exclamations and a breathless photo with the trophy, Acheatel said, "I thought it was bigger."